Many people were asking at e.g. Lonely Planet forum how to organise boat for cruising around Raja Ampat independently and whether that is possible at all, so I will write about our experience here. The boats that can be hired in Sorong are esentially fishing boats. They do not wait there for tourist passanger, they are used for fishing. There usually have some covered sleeping area for usual crew of 4-8 people, but of very different sizes and comfort. 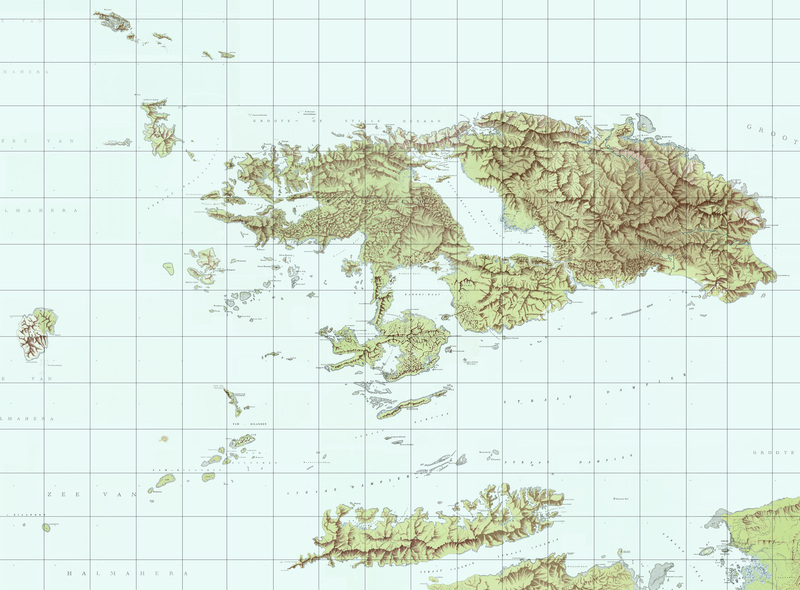 Sorong probably has not 1 central port. There are several small fishing ports and then river where many boats are parked near owners houses. After we visited the port where public boat leaves for Waisai and 2 other fishing ports without much success, during maybe 5 hours, we were eventually very lucky to find very suitable fishing boat along the river. Rifai, the owner even spoke very good English. Rifai is reliable, flexible and keeps his word. 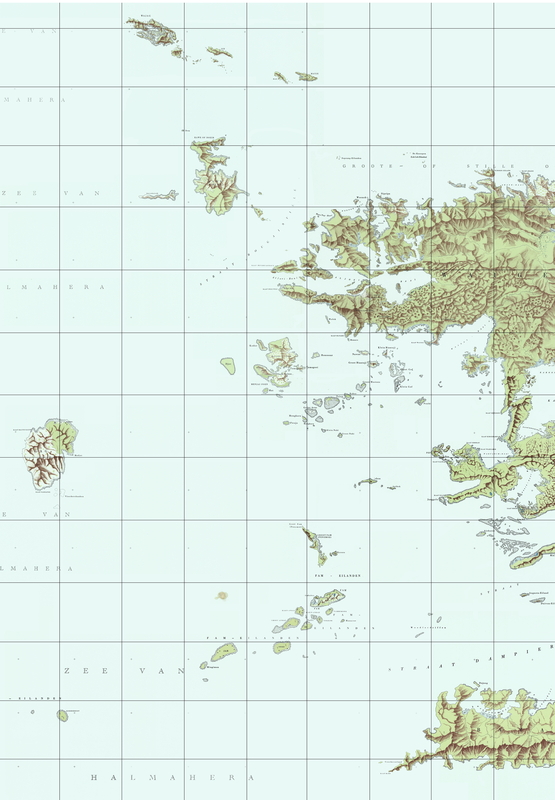 You will probably want to go to Wayag archipelago and be able to sleep on the boat as well. For this you need boat at least about 15 meters long. At the time we were there, such boats could be found in Sorong, but not in Waisai. These bigger boats usually have built in diesel engines and diesel is more economical than gas used for outboards (lower rotation speed, consumes less fuel). All diesel needs to be brought from Sorong as people in small villages in Raja Ampat own and use outboards for gas, so only gas can be bought there. It is better to buy much more than necessary needed and fair boat owner should deduct price for not used fuel after trip ends.It is very good to take small wooden canoe with gas outboard for approaching beaches conveniently and for going around small islands and channels. We had such boat (maybe 5m long) that was tied on the rope all the time behind our big boat, no problem with that. We agreed one day in the evening about price etc., there was one day whole for shopping, getting fuel and boat preparatin and next day before noon we were leaving Sorong. During the preparation day, when we went shopping for food for 17 days for 6 of us and 4 of crew, RifaI managed to arrange wooden deck to be made on the originally fishing boat, so that we had superb place maybe 3.5x3.5m where to lie and sleep. This place was covered strong plastic tarp to protect again sun and rain. The only orignal covered place located above the engine room was left to store our backpacks and for the crew to sleep. We even had even fridge on the boat, powed by electricity from separate small gas engine for maybe 3 hours a day. So this fishing boat was a bit upgraded towards boat for people and Rifai wants to use the boat for tourist trips in future. The only thing the boat was missing was decent ladder in order to climb to the boat right from water. We somehow forgot this before we started and the crew later adjusted some other ladder on the boat, but it was still very difficult to climb up. But climbing up from or over the wooden canoe was easy. Next time we would recommend that the cook will be present for shopping, so he has what he needs. Most of the time we had just plain rice, fried rice or rice with noodles, often with some chili sauce and often fresh grilled fish ??? when crew caught it, we or crew speared it or we bought it. The cook was not bad but I think he could do more if he had been shopping with us. Our crew consisted of captain, cook, engine man and cook/general asistant. Rifai was not coming with us. The crew speaks Indonesian only. I mention our setup for our boat here, as I expect similar setup could be used for many similar fishing boats. And as Rifai and his boat and crew were very good in Papuan standards, I expect some people to take the same boat in near future. Indonesian is easy language and one can learn enough for daily communication on the boat e.g. from Pimsleur Indonesian Audio Course or Learning Indonesian audio course as me. We were surprised how friendly both Indonesians and Papuan were. We as tourists were point of attention in good sense constantly and even more modern Indonesians and Papuans often took photos of us with them, usually using their smartphones. And even in Sorong. For our 17 days stay, we paid approximatly 20 milion IDR for boat with crew plus about 4.8 milion IDR for 3x200 liter of diesel (1 liter cost about 8000 IDR, we started with 4x200 liters but consumed and paid only 600 liters). Plus we consumed a lot of gas for the small 15hp outboard and electricity generator (price of gas was I think 12 000 IDR per liter in Sorong and a bit more in shops and villages around Raja Ampat), so maybe 1.5-2 milon IDR for gas. We spent maybe 8 milion IDR for food for us and crew (but maybe half of that was for not necessary stuff like beer and coke as we had the fridge ...). The total was about 3300 usd, so about 550 usd per person. Given the prices in Papua, I consider this very good price. 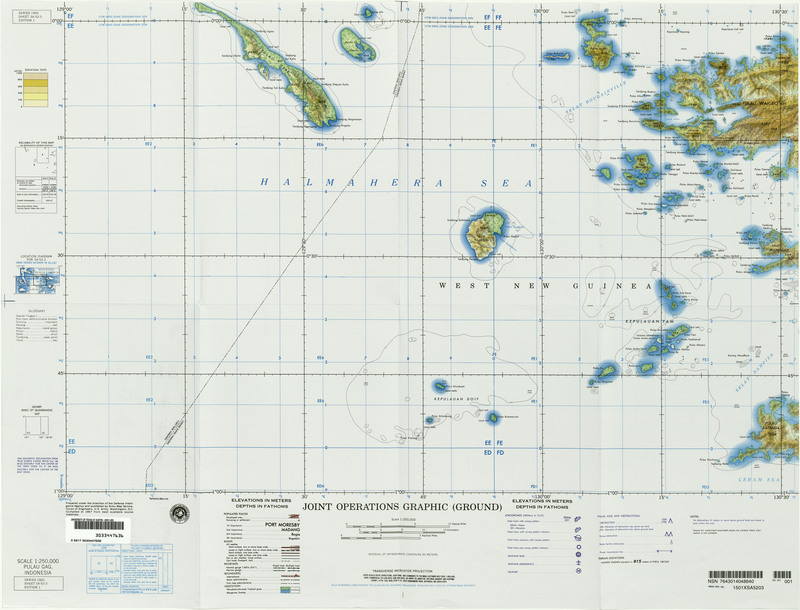 Our captain new bigger islands in Raja Ampat and how to navigate there, but Garmin GPS with Garmin Blue Chart marine map for Papua area was very usefull. 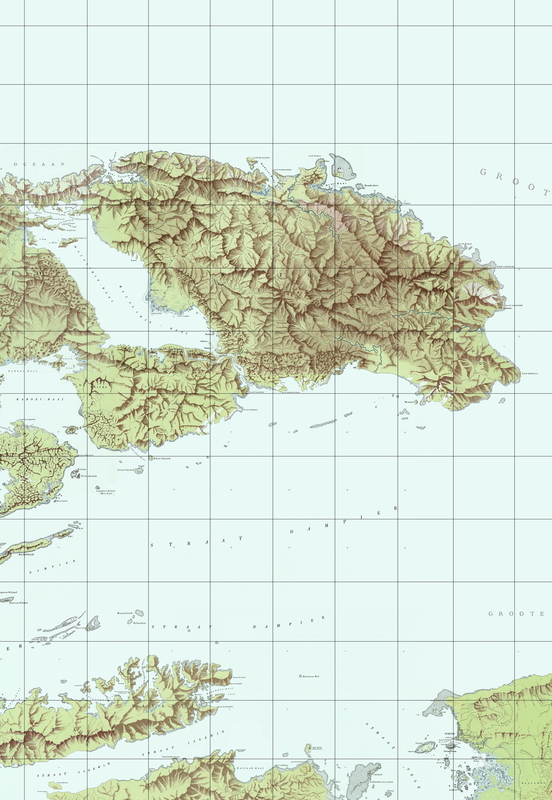 The printed Dutch map for Raja Ampat area was also very usefull for overall planning and for explaining to the captain, where we wanted to go. The captain was basically willing to go anywhere we wanted. The exception was Wayag, the gem of Raja Ampat, that was closed by local villagers at the time we were there. The cause was probably some dispute about compensation between local people that had widely recognised fishing rights there and local government that wanted them to stop fishing there. I don?? ?t know whether diving liveboards (that I think don?? ?t stop at villages and dive often a bit off the islands) went there at this time. But our boat with local captain stopped at villages often and when we said we were going to Wayag they insisted that Wayag was closed. We eventually went there during night. When we appeared in the main bay in the morning, first noone was there, so we managed to go around in the small boat and find place where the trail up the the ridge starts. I can?? ?t understand how the trail to such gorgeous viewpoint can start at sign saying ?? ?trail prohibited??? or something like that, but at least we found the trail by accident this way. After some swimming around, some local (but not official) person appeared in boat, reminding strongly to our captain, that Wayag was closed. So we spent less than 1 day in Wayag. But we were lucky go there at all in this situation and even find path up to the ridge for viewpoint. Note that the path was steep with sharp rocks and should be undertaken in good sandals or preferably light trekking shoes. But the viewpoint was worth all the effort as it enables you to view Wayag like the famous promotional pictures from airplane ??? something that was possibly the reason for many people to come to Raja Ampat in first place. 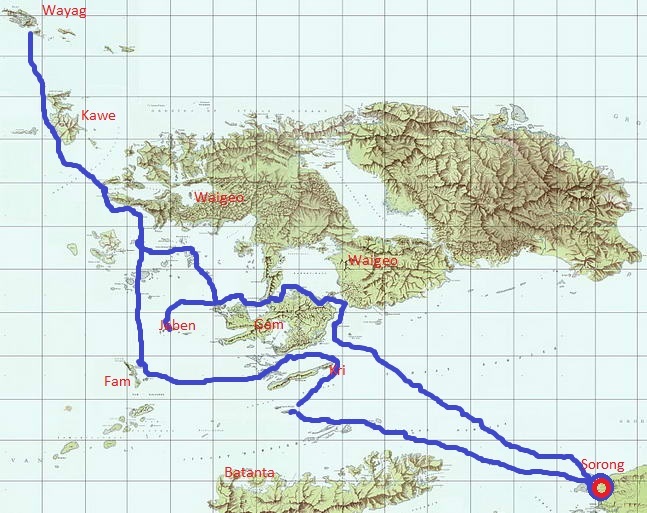 No one required surat jalan in Raja Ampat, although in theory one should have it. We got one easily within 2 hours in Sorong at district police station later for the following trip to Baliem Valley. I think that such very officially looking piece of paper might possibly had helped us to get to Wayag (or stay there longer) if we had if for Rajam Ampat with Wayag written on. I think Wayag was not oficially closed by govenment of Papua or even local government of Raja Ampat, but by local villagers only. 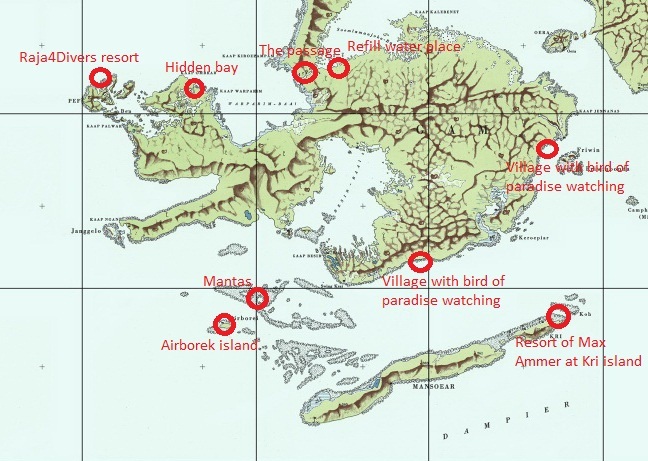 If one wants to go diving at some dive resort or just to go by boat to Wayag, so called Raja Ampat PIN is needed, for 500 000 IDR (will be 1 000 000 in future). It is easiest to buy this in Meridian Hotel in Sorong. Other option is Waisai. It is a pity, that it is not possible to rent diving equipment with portable air comressor and a guide for several days in Sorong or Raja Ampat as boat such ours could serve as simlple budget diving liveaboard. Diving in Raja Ampat resorts cost us about 80 usd per dive including equipment rental, much more than elsewhere in Indonesia. And you are lucky to get the opportunity to dive in the resorts at all, as they are full with their accomodated diving guests most of the time and do not have diving capacity for non guests. We visited several resorts on the way and eventually dived with Swiss run Raja4Divers as they were both available and friendly to us. It is probable, that when you just appear there at resort and want to dive same or next day, they will have no capacity. We had maybe 500 liters water tank on the boat. And we refilled it once in a locally well known refill place near just before The passage when comming from the east. It is originally stream from jungle and some person probably built hut and jetty and collects some money there already. In Sorong, we stayed in medium expensive Belagri hotel (about 500 000 IDR room), after we tried others from LP guide, that were full. Tho hotel was very nice and wifi was working even in rooms (working wifi was theory but not reality in many other hotels). There was quite big hotel (so should have room most of the time) just next to Belagri, we have not tried it and this was for about 350 000 IDR room. They seemed to build some house or small resort there. The shelter used as watching place is about 20 min by easy trail. It is possible to do independently as it does not start exactly from village. But it might be better with guide at leasst for the first time as the birds are not exacly close, it is not like BBC or NG documentary at all and one does might not know what to look for in the distance. 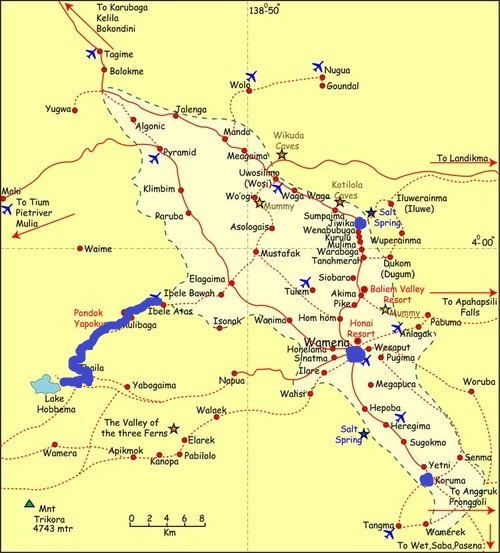 We did just quick 6 day visit, that was focused on 4 day trek from Lake Habema to Ibele village. I have not found any gps tracklog for this, so we went with guide (Cosman that is mentioned in LP guide, he is very good and reliable) and 4 porters. I am still not used to guide and porters, but when one pays for, guide already (500 000 IDR per day, almost 50 USD), the porters come quite cheap (150 000 IDR per day, almost 15 USD). They were friendly and amusing bunch of Papuans from Lani tribe (together with Cosman). Cosman speaks English, porters not. For me it was difficult to comunicate with porters in my basic Indonesian. So may original plan to take porters only to show us the way would not be practical. There is now completely sealed pretty road from Wamena to Lake Habema. But they still asked crazy 3 000 000 IDR (as written in LP guidebook) for 4WD pickup to go there (one way takes about 2 hrs). I hope this will change in future, normal car could do it as well. And normal car costs not more than 1 000 000 IDR for whole day when rented with driver for going around villages in Baliem valley. We spent half day walking around lake Habema, so the actual Habema to Ibele trek took usd 3 days, walking approximately 5-6 hrs a day. I think it is impossible to do this trek intependently without help of gps coordinates at least for the starting point that is about 1 hr walk before Habema when approaching from Wamena. There is no sign there and the trail is not much visible here. On the way, the trail goes steeply down by stream sometimes and it is not much visible as well, but it would still be possible to follow it independently if one really wanted. There were open shelters with roof at Habema lake, good for putting tent inside, plus one closed hut good for Papuans who make fire (but ok for up to 10 people to sleep on the ground). After Habema, the first night is usually in a hut in the jungle. The hut is quite spacy even for small group with porters (up to 10 people together). But as Papuans here do fire inside with a lot of smoke, it is as always better to sleep in a tent next to the hut. Second night was spent in very nice house of probably local teacher in some village on the way. The first village on the way for the second trekking day appeared sometime around noon, but it was still maybe 3 hrs to the village with school where we slept. From here, it is vey good path, even a bit boring in the end, to Ibele. Shared cars wait near road here to go to Wamana for 10 000 IDR per person only. It is not necessary to take trekking poles for this trek from home as this is jungle and good walking sticks can be made easily. For me, it would be very difficult to do this short trek without a stick. Times are changing and there are not much naked Papuans with kotekas waking around Baliem nowadays. But we could still see one or two at the big Jibama market near Wamena and they did not seem to be there for tourists. The individualsin Wamena itself are there for tourists to be photographed for money usually. And some individuals could be met walking along the car road connecting Baliem valley villages, obviously on it?? ?s own way, not being there for tourists. Maybe in 10 years from now only the few that are there for tourists in Wamena (and of course Jiwika) will remain in Baliem valley. In Wamena, we stayed in Pilamo hotel, one of the best, although more expensive (about 700 000 IDR for 3 people. It was level above anything else we visited on the way to find reasonable hotel in Wamena. It is necessary to have surat jalan permit listing this trek route. But it was checked in Napua road post, outside Wamena only. Snorkelling with about whale sharks that have around 6 meters and can be touched easily (although I know they write everywhere that this should not be done, but they have such good feeling skin ...) is the (only?) highlight of coming to Nabire. We found a boat after maybe 2 hours of asking for it. But we did not have such luck as in Sorong. The boat was quite long, but not very stable. It was quited expensive. For 3 days trip, people were asking 10 000 000 IDR (compare to our Raja Ampat deal ...) including fuel and possibly food. We finally agreed on 7 000 000 as it was evening already and we did not want to loose 1 days out of out 3 full days for whale shark trip. They offered as just a bit lower offer for just dropping us in Kwatisore, but we would be at mercy of few small boats there, not good offer at all. According to LP guidebook, travel agencies want similar sum even for 1 person. The whale sharks come to fishing boats or platforms known as bagans in Indonesian. They like to eat some very small fish the fishermen from bagans give them. The nearest bagans to Nabire are near Kwatisore village. We did the mistake of not having Kwatisore and it's bay written in surat jalan permit. Because of this they asked for some money in Kwatisore, but it was not much. Kwatisore is maybe 3 hrs by boat from Nabire. There were maybe 10 bagans near Kwatisore. The whale sharks are not all the time there. But I think that if they come to some bagan, they can stay up to several hours there, if the fishermen feed them a bit. Ideally, the fishermen should have small radios to announce if they have whale sharks, if they wanted to do proper tourist attraction from this. But they don't have it of course. We had good luck to meet the out first (and only) whale sharks right during the first day. Later, we had bad luck to break both propellers of our boat at night anchoring site during storm. The crew did find some replacement propeller at some bagan, but not ideal, the boat was slower and they wanted to go back to Nabire immediately. So we cut the originally agreed sum of money and visited a few bagans on the way back to Nabire during our second day on the boat. But we did not have luck for whale sharks again. The third day was spend nice beach spot about 30 km from Nabire. 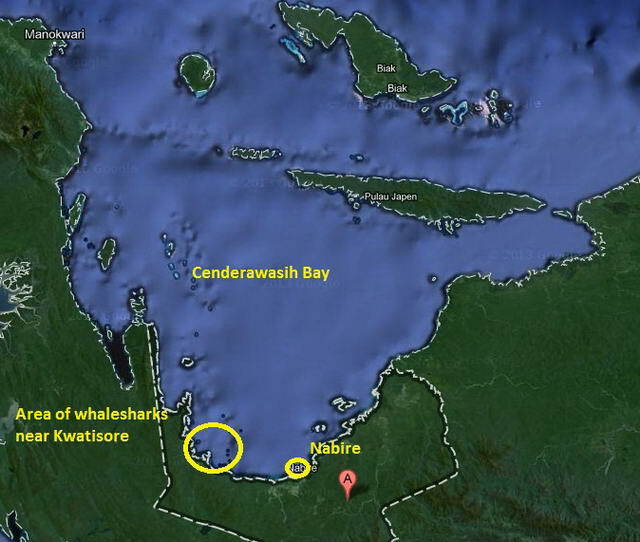 The area of whalesharks near Kwatisore seems to be already inside Cenderawasih National Park. But this park does not have office in Nabire I think and even requires rangers to accompany boats. Fortunatelly no one asked about any entrance permit etc.